Should We Bring Back the .38 Special? Is the ubiquitous .38 Special revolver passé in today's semi-auto world? Not by a long shot, says Sweeney. When the .38 Special was offered to the shooting public back in 1898, smokeless powder was less than a generation old. And for a long time it was a caliber rather well thought of. Then, sometime in the 1960s, when so many other things changed, the .38 Special cartridge became something to look down upon, mock and even disrespect. Why? I guess in time all things traditional and functional become old hat and have to be tossed aside—later reevaluated and then reconsidered. But the .38 Special? Hornady FTX (l.) delivers mild recoil, expansion and penetration. In +P form (r.) the FTX delivers more expansion and penetration—but at the cost of more recoil. My thoughts on this came from testing the Hornady Critical Defense ammo in a .38 snubbie. It was an all-stainless S&W Model 60, a police trade-in backup gun. The recorded velocities were quite a bit under the ones listed on the box, which came as no surprise. But their tested terminal performance was interesting. The 110-grain standard-pressure loads ran just under 1,000 fps, and the +P loads ran just over that mark. Before you snort in derision, that's from a barrel just shy of two inches long. The standard-pressure FTX expanded and penetrated, although not to FBI satisfaction. The +P load expanded more and penetrated more. If you can handle the extra hassle of the muzzle blast, the performance bonus is worth it. Let's compare those to other compact carry guns—some .380s and some really short-barreled 9mms. First off, no .380 load in existence uses a bullet of 110 grains. The heaviest is 100, and you won't find those 100-grainers leaving the muzzle over 800 fps. To break 800 fps and approach 850 in a compact .380, you have to settle for 95 grains of bullet weight. A 9mm will match the 100-grain weight, even best it, with 115-grain bullets. However, a quick flip through my chrono logbook shows me that 115 is not a laser beam bullet out of a compact 9mm that you'd expect. Out of a three-inch barreled 9mm, 115s typically go the same speed that 110s do out of a snubbie revolver: just over 1,000 fps. On a recent test with a three-inch 9mm, I tested seven different 115-grain bullet loads, only one of which exceeded 1,100 fps. One 115-grain load—a 115-grain +P+—topped 1,200 fps but that was absolutely no fun to shoot. An ultra-compact 9mm pistol with skimpy grips is not easy to shoot. Yes, a flat and small 9mm hides well and carries easier than a two-inch revolver, but the revolver gives you more to hold on to. Curious about this, I tried some other loads as well in the Model 60. The next step up in weight was Black Hills Blue, reloads using 125-grain JHPs. This is practice ammo, but some might use the load as carry ammo. The velocity was modest and recoil was likewise. For someone who is recoil sensitive, this would still be fun to shoot. However, the velocity loss means marginal expansion at best, and while the nose shows some signs of starting to open, it isn't the classic mushroom shape. But no expansion means extra penetration. The Black Hills load exceeds the FBI minimum and risks exiting a block of gelatin. The next step up in weight was Speer Gold Dots, 135 grains and +P pressure. Noticeably more robust in recoil but still far short of obnoxious, they expanded and penetrated. While the .38 Special Gold Dots would fail the FBI barrier tests—and I do not know of any .38 Special load that passes those—it exceeds the FBI minimum 12 inches in bare gel. Entering the top end of bullet weight, we enter the no-expansion realm out of a snubnose .38. I shot Cor-Bon 147-grain full metal jacket, Blazer 158-grain lead round nose and Hornady 158-grain XTP. None expanded, nor would I expect them to. Actually, none has ever expanded, and it was notable to recover neither the Blazer nor the Cor-Bons. Even at the modest velocities they muster, they will consistently exit the back of a gelatin block, even an 18-inch rifle block. I have used the Cor-Bon in competition, where its modest recoil and excellent accuracy serve me well. Now, the lack of expansion and the modest velocity of the heavyweights may be of concern to some. Just remember we can't get something for nothing. Yes, we could ask for more, but at what cost? By the time you accelerate a 158-grain bullet to expansion velocities, we've used up all the easy-to-carry goodwill that a compact handgun provides. It is no fun to shoot, regardless of caliber. And if you think center-punching a miscreant through the sternum with a 158-grain lead round nose is an inconsequential wound, you've been watching too many vampire movies. So far I've been considering the performance of the .38 Special in ultra-compact carry guns. The lightest, such as the Smith & Wesson Model 442, weighs 15 ounces. A Ruger LCR weighs 13 ounces while the Model 60 is a relative heavyweight at 19 ounces. What if we move up? There are a lot of .38 Special revolvers that are now considered "too big" to carry, despite having been carried in decades past. A .38 with a barrel of four inches or longer can serve well as a house gun. Smith & Wesson made a bazillion .38 Special Model 10s, most with tapered five-inch barrels. The K-frame grip is one many shooters find comfortable, and every grip maker who makes grips for revolvers makes them for the K frame. 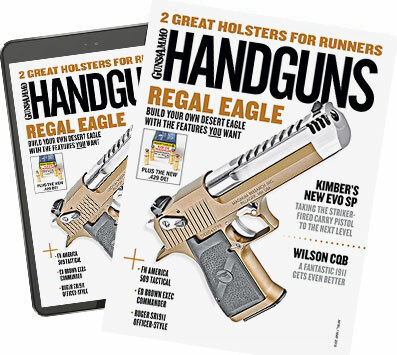 Rugers are legion, and the medium-size wheelguns are in the mid-30s when you tote up the ounces. Soft recoil is the main menu item here. Four-, five- and six-inch barrels are going to boost velocities an appreciable amount. These longer barrels, driving their bullets faster, will generate more expansion and do so with less muzzle blast and recoil. That's a combination difficult to dislike for a house gun. Further, the grips of the medium-frame guns are easy to hold and shoot. As a house gun or a nightstand gun, a "too big to carry" .38 can be a useful tool and a comforting one, too. I can see some doubters in the crowd. While the performance of the .38 measures up to our 9mm expectations, the hue and cry goes up: "It doesn't hold enough ammo." I guess that depends on how much missing you plan to do. If you walk into a gun shop and its sells ammo, it will have .38 Special ammo of some kind on the shelf. And as a final bonus, when it comes to reloading, the .38 Special is king. There are more available components, more powders that work, than any other caliber. When it comes to the categories of no-drama and easy-to-reload, there is no caliber that even pretends to contend with the .38 Special. With all that going for it, will someone please explain to me why we fell out of love with this cartridge?